Where was Perth’s first gym? There is, apparently, anger at the news ECU is thinking of privatising its gyms. All the users will get in exchange is better opening hours and increased investment in the equipment. Outrageous! But this does lead to the historical question: where was WA’s first gym? It’s not an easy question to answer, since it depends on what you mean by gymnasium. The school at Fremantle had the first equipment, but it wasn’t open to the public. In which case, we nominate Stirling Square at Guildford. Some wooden gear, painted white, was erected there around 1885. This was organised by future MLC and local businessman, James Morrison, who was worried about the local larrikins and wanted to give them something energetic to do. The following year, Wellington Square got Perth’s first outdoor fitness centre. There was a trapeze, a horizontal bar—one for adults and one for kids— rings and a climbing pole. While it was popular, residents complained the unpainted wood made it look half finished. A commercial gym was established in 1887 by William Rosevear at the back of his ironmongers in William Street, right where the entrance to the Bankwest Tower now sits. The club taught self-defence, and had a horizontal bar, free weights and other equipment. 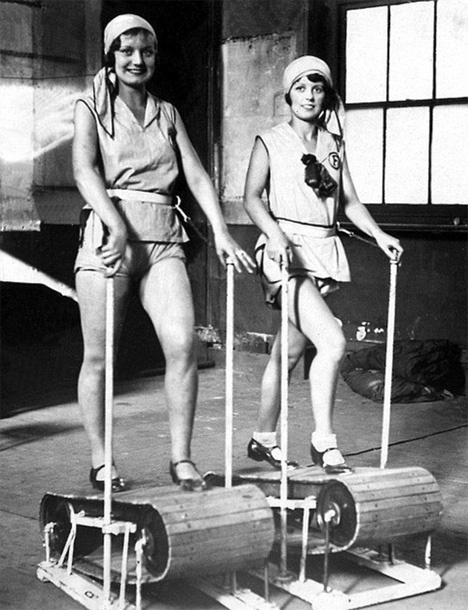 The 1880s saw an obsession with gyms because of the rotten kids. Boys were standing on street corners, smoking and swearing, while the girls were walking the streets looking for a quickie. The solution, known as Muscular Christianity, believed that anaerobic exercise resulted in more spiritual souls. As the Dodgy Perth staff can testify. After a good gym session we are in no state to smoke, swear or seek one night stands. Muscular Christianity works.